Set your spirit of adventure free with this lavishly illustrated trip around the world. 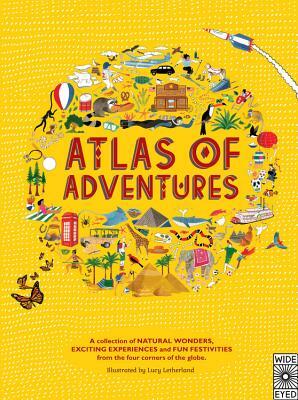 Whether you're visiting the penguins of Antarctica, joining the Carnival in Brazil, or taking a canoe safari down the Zambezi River, this book brings together more than 100 activities and challenges to inspire armchair adventurers of any age. Celebrate the great diversity of our planet: with every turn of the page, you'll come across different animals, people, and sights unique to each of the locations. Look out for two adventurers in every scene as you travel through the book. Discover with them hundreds of things to spot and learn about. Each section begins with an infographic map of the region it explores, followed by richly detailed two-page spreads featuring its most fascinating locations. You’ll get to go to sleep under the Northern Lights, meet millions of monarch butterflies in the boreal forests of Mexico’s volcanic mountains, shower with an elephant in Chiang Mai, and go snorkeling in the Great Barrier Reef, among many other amazing adventures. Interesting facts and figures pepper the scenes. Did you know that London’s Big Ben clock bell weighs as much as a small elehant? Or that more than one-third of the world’s commercial supply of pineapples comes from Hawaii? A “Can you find?” page at the back challenges you explore the pages even deeper by locating the pictured people, animals, and things. Rachel Williams is the award-winning author of Atlas of Adventures. She lives and works in London. Lucy Letherland is an illustrator based in London, UK. She graduated from Manchester School of Art in 2011 with a First Class BA (Hons) in illustration with animation. Lucy's work is strongly led by humor and narrative, creating a playful, graphic quality. Her books include Atlas of Adventures, Atlas of Adventures: Wonders of the World, Atlas of Animal Adventures, and Atlas of Dinosaur Adventures.